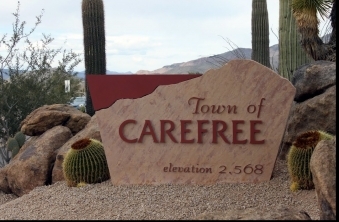 Carefree is a rural, residential town of approximately 3,500 people, residing in 1,900 homes, slightly more than 8 square miles in area, located in the northeast portion of the greater Phoenix metropolitan area. Carefree is nestled around Black Mountain and its land mass also continues to the northeast of this prominent landmark. Ask our residents what made them move to Carefree and many will mention the natural beauty of the Sonoran Desert, the clean air, less traffic and ideal for people who treasure peace and tranquility in their surroundings. Once living in Carefree, residents stay because of the people and the outdoor lifestyle available to them. Carefree residents are active and involved in a broad cross-section of activities. Ranging from young families to retired professionals, they are all living their lives to the fullest. Many Carefree residents participate in a number of activities ranging from involvement in the local schools, participating in activities offered by one of the local churches and the numerous non-profits, and dining with friends at the many fine restaurants throughout the Desert Foothills. -Temperatures in Carefree are typically 5 to 7 degrees cooler than the adjacent towns to the south. Carefree has an elevation of approximately 2,700 feet, considerably higher than Scottsdale at 1,250 feet and Phoenix at 1,100 feet. -Carefree does not assess a town specific real estate tax. Annual real estate taxes in Carefree are approximately half of what would be charged for an identical residence in cities and towns which have town specific real estate taxes as an add-on to the annual real estate taxes assessed by Maricopa County. For a median priced home in Carefree with a full cash value of $535,000, the incremental annual tax cost for an identical home in Scottsdale would be $3,100, and $2,900 in Phoenix.